Keystone RV has long been a trusted name in recreational vehicle manufacturing. From big to small, Keystone consistently delivers a quality product campers can depend on while out on the road. With this in mind, we’ll take a look at the Keystone Hideout Single Axle Travel Trailer. Designed to meet the needs of fuel conscious campers, this compact travel trailer is perfect for weekend getaways and impromptu camping trips. Despite the Hideout Single Axle’s size, this travel trailer is built with the quality you’d expect from Keystone. Exterior features include a cambered chassis, powder coated l-beam frame, hurricane straps reinforced structure, and a full walk on roof. Not only is the Keystone Hideout at an affordable price point, you will save money in fuel and with your tow vehicle as well. Floorplans range in size and can even sleep up to 6 as with the 185LHS bunkhouse model. Inside you will find a cozy and comfortable interior perfectly designed to make full use of storage and living space. Little touches like the light and bright interior design and reversible dinette cushions make the Hideout stand out visually. 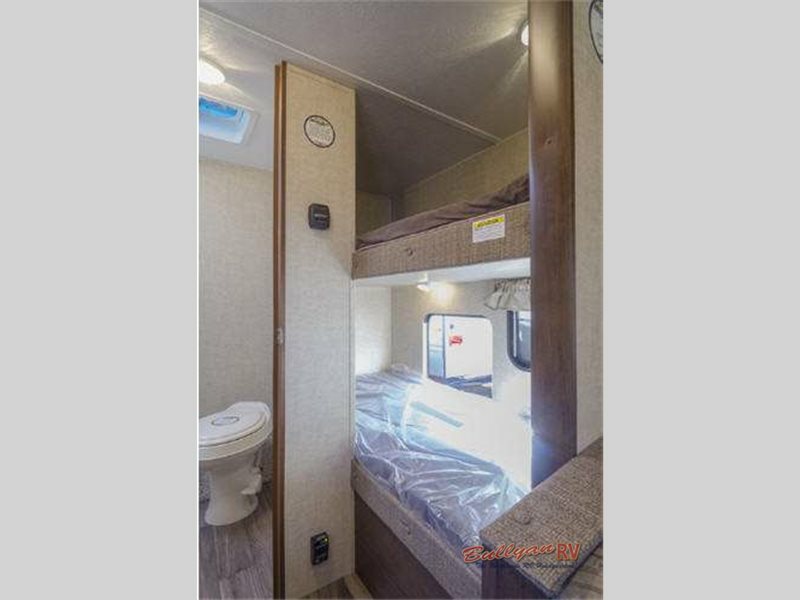 Nuts and bolts features like predrilled and screwed residential cabinetry, 4 1/2″ crowned roof and flex plex tubing with 10 year warranty will make you happy years down the road when you’re still enjoying your travel trailer in good condition. 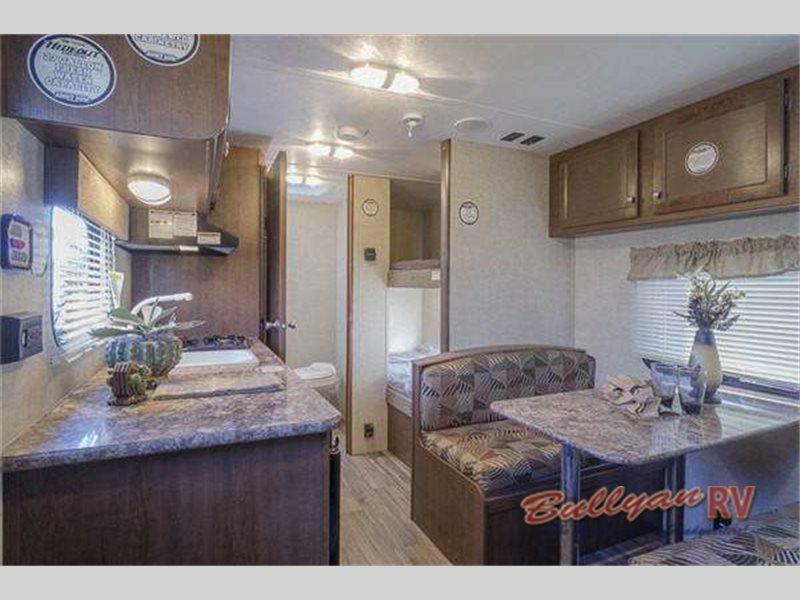 This camper keeps getting better because Bullyan RV has the 2017 Keystone Hideout 185LHS at a screaming deal of $12,495 or $125/mo o.a.c. Quality of this kind is hard to find at this price point. This bunkhouse floorplan offers plenty of seating and sleeping space so everyone can be comfortable while relaxing and enjoying the great outdoors. Why not move the party outside under the large awning and jam out to some tunes playing on the outside speakers. After all, that’s what camping is all about… making memories with family and friends. 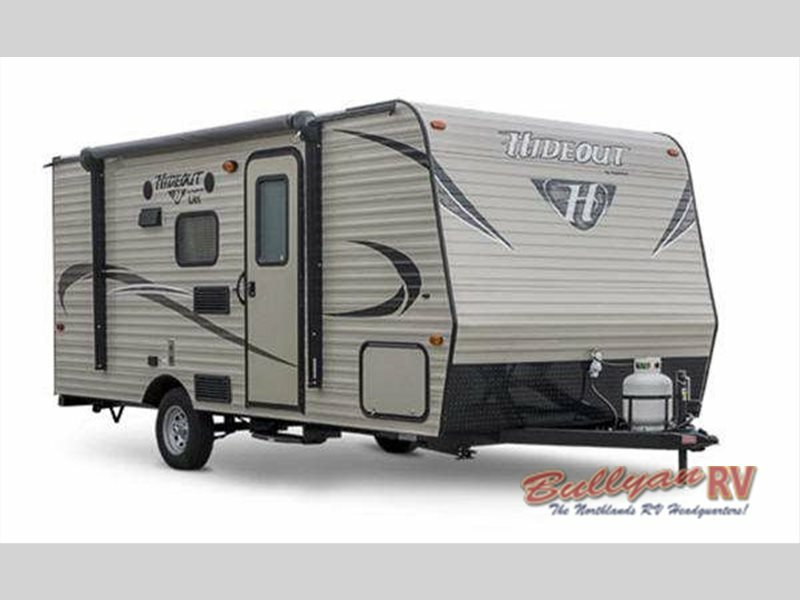 If you’re looking for a compact travel trailer that’s built right, Contact Us at Bullyan’s RV and we will walk you through the Keystone Hideout. See for yourself why Keystone RV stands for quality.